Being in the hair industry for 30 years, Creamsilk truly knows what it takes to have beautiful hair that's healthy and shines, and they just keep on getting better and better by adapting to the ever evolving needs of hair. That said, have a look at Creamsilk's newly- reformulated range: seven new variants, seven new ways to transform your hair. Creamsilk's new formula has been specialized and customized to provide care that our hair deserves. 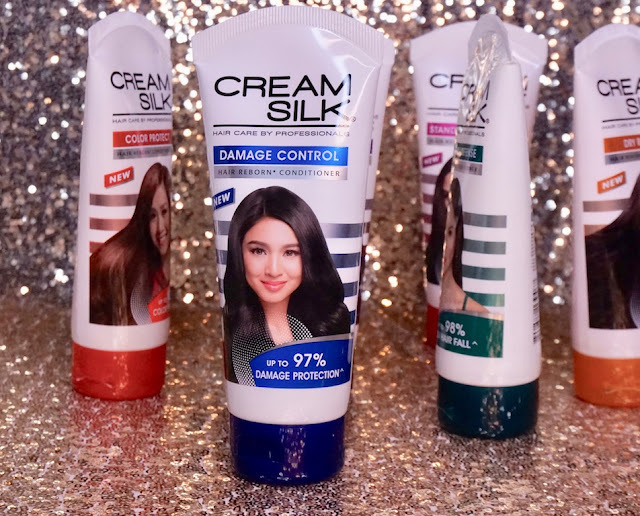 The packaging also features Creamsilk's endorsers who communicate the persona of the Modern Filipina; I also think that they best represent the conditioner variants they are on, given their lifestyle. Broadway star Rachel Ann Go represents Color Protect; singer and actress Julie Ann San Jose for Dandruff- Free, Miss Universe 2016 Pia Wurtzbach for Stunning Shine, actress Nadine Lustre for Damage Control, actress and painter Heart Evangelista for Standout Straight, actress Coleen Garcia for Hairfall Defense, and actress Yassi Pressman for Dry Rescue. My hair's always damaged due to everyday blow drying, color, and exposure to heat, sweat, and pollution as my work requires me to go around the city everyday; it also doesn't help that my hair's pin straight and thin, thus damage is more pronounced. My favorite is Cream Silk Damage Control because its deep conditioning properties helps get rid of frizz, softens my hair, gives it some shine, and gives it a little bounce to boot; it reduces the look and feel of damage overall, and it's one of my go- to, instant hair revivers when I don't have time to sit around and wait for a hair mask to settle and treat my hair. This is one of the most extensive conditioner line- ups I've seen and I'm glad that one of my favorite conditioner brands is always improving to cater to the hair demands of modern Filipinas like me! 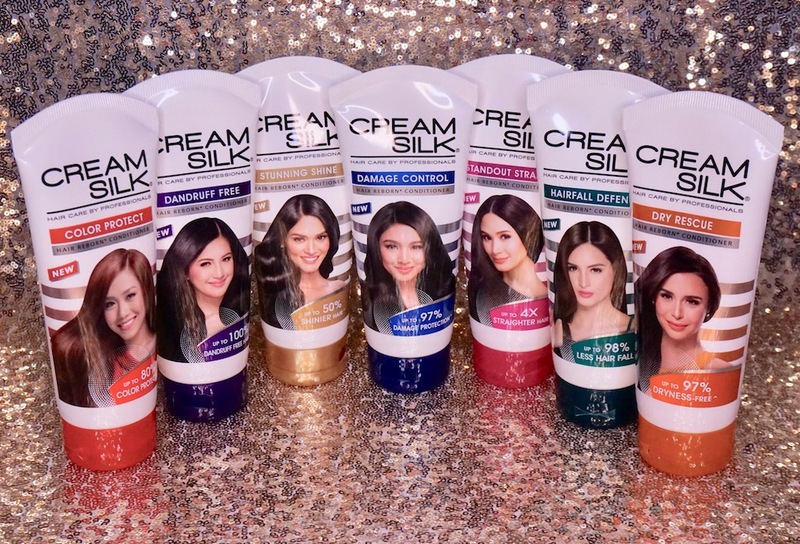 What's your favorite Creamsilk variant? For more information, visit CREAMSILK PHILIPPINES on Facebook. Disclaimer: This post is brought to you by Creamsilk Philippines and The Beauty Junkee. I love Cream Silk! using it for almost 5 years na! Sulit tlga ang transformation ng product cause it's totally effective! It makes my hair strong and shining! Damage Control for me but I was shocked to see the new cream silk conditioner at first as it has nadine lustre in the cover. I thought it's fake. I feelthe same way about these products, Ms. Martha! I've actually used this since I was a little girl! Growing up, I usually use the green or the pink ones since they work for my hair the best. Good thing about it is that I don't have to use it everyday for it to be effective. Using it 2-3 times a week is enough. Unlike other conditioners. This one like for a hair spa treatment already! Hahaha! Love their line foreverrrrrr. Thanks for this! I'm not much of a fan of Creamsilk bcoz it tends to wear my hair down. Maybe this newly reformulated conditioner will change my mind and give me much better results for it has wider range to choose. Good thing about it is available in sachets that I can try.